Available now, the Mike Dowling signature model El Trovador Cutaway. Ten years after the re-issue of the original El Trovador, National Reso-phonic has honored Mike again with the release of the El Trovador Cutaway. 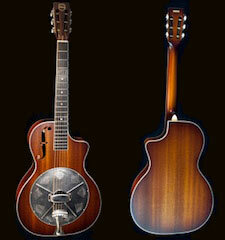 Hear Mike demo this fine resonator guitar at Peghead Nation and NRP and order directly from Mike at 10% dealer discount. Grammy-winning Mike teaches his method for translating time-honored 3-note swing chords into a simple digital code that will have you playing classic swing songs in little more than the time it takes to read his explanation. 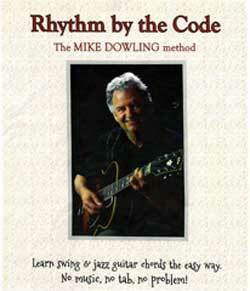 To order Rhythm by the Code click here. 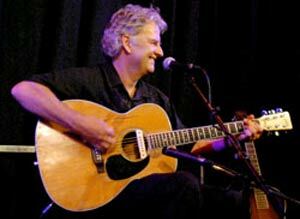 "Dowling is one of the most relaxed and highly skilled acoustic guitar players of his generation that I have ever heard. Everything he performs appears natural and deceptively effortless, and with a tone, particularly when he plays slide guitar that is very much his own and that very few others can emulate. 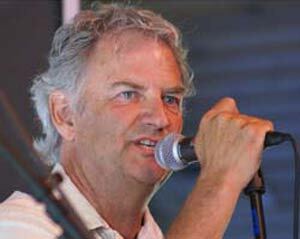 His vocals have an engaging edge and alongside his consummate guitar skills there was nothing to criticize. After a number of encores a member of the audience spontaneously stood up and gave a heartfelt thanks to Mike for such a wonderful evening." -- October 2003 performance review, Blues in Britain.